I’m going to get down to business here without too much editorializing. The only prereq is that you have an Intel-based Mac and a medium level of skills with text editors or visual web page designers. You don’t need to know how to write Objective C or any other complex “Native App” skills. 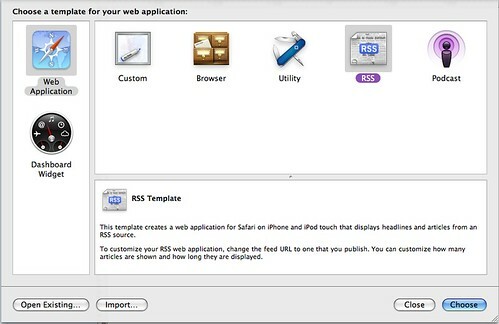 I’ll take you step-by-step through a simple process for putting together a number of free tools and technologies in order to bring your blog (or any other RSS-based feed of content) to the iPhone or iPod Touch in a super cool and quick way. 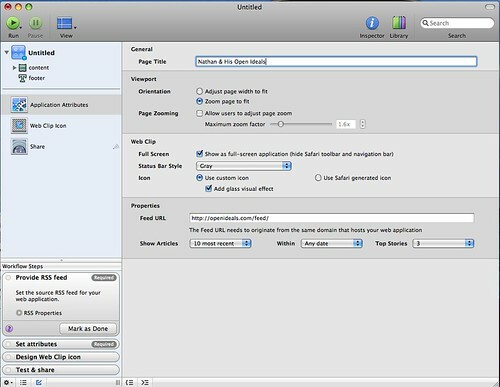 2) Launch the Dashcode application and select the “RSS” template option. 4) Customize the look and feel of the blog display using the type of fancy visual editor… you can change the entire color scheme, fonts, spacing and more. 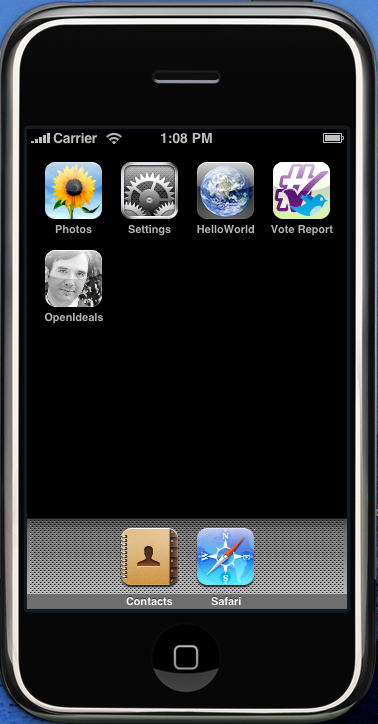 8) Open the archive, navigate to the “iPhone” folder and then run the “Glass.xcodeproj” xcode project (duh?) file. It should be the only “blue” file in the folder. From here, you can modify the icon.png and Default.png (splash screen) until you are satisifed with the outcome of how your app looks. 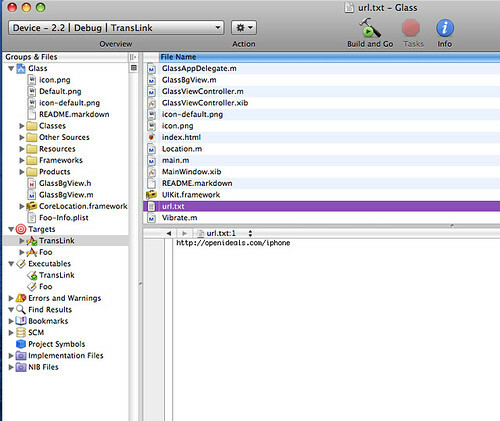 Also the “Info.plist” file controls the name of your application in the iPhone launcher. 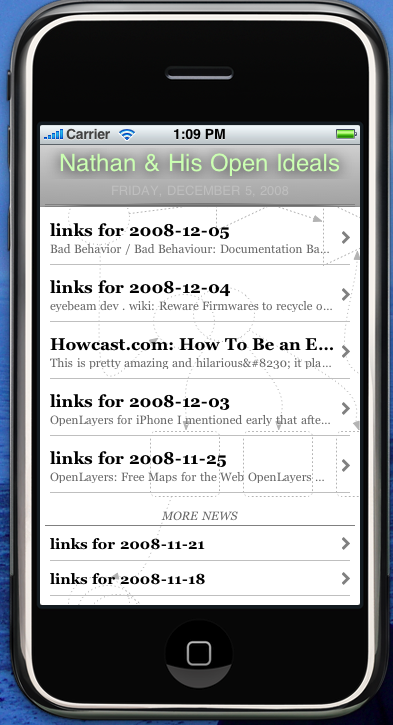 At this point, you should have your blog running as a native application in the iPhone Simulator. To actual get this application out to the world, you’ll need to pay Apple $99 to join their Developer Program, as well as jump through many hoops to get all the security keys and permissions to distribute your application. Otherwise, you can also just point people with iPhones or iPod Touches directly to your mobile application URL… that would work, too! That is all for this post… I hope you found it useful and to the point. 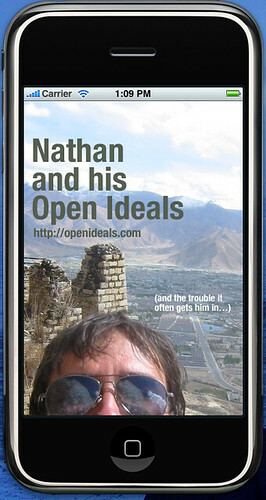 I may do a similar one for Android + Eclipse, especially for all the non-Mac OS users out there. Excellent how to, I will have to try this, thanks. thanks for sharing this brilliant information with us, It will be very useful for all. This post is different from what I read on most blogs. Congratulations on a well written, interesting and superb post! Where else could anyone get this kind of information in such a clearly presented way?! I genuinely like the way you have expressed this. Thanks for not only taking the time to write this, but to even the information by making Generic Amoxil online easy to read and understand. Great Article. Do you have instruction for Window developer? I just read through the entire article of yours and it was quite good. This is a great article thanks for sharing this informative information. Buy Valtrex I will visit your blog regularly for some latest post. Version ist, Eneloops die maximale Kapazität Serie Akku Dell D820 Akku Produkte, 2.500 mA Strom. ℃) in dem Fall, kann trotzdem weiterhin den Strom für das Gerät. I like iphone very much..Amazing specification and features given..Great work. 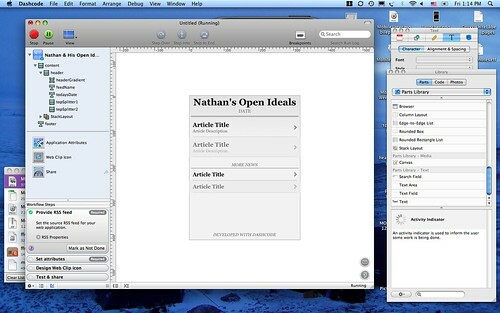 That’s very useful post regarding turning blog into a a native iPhone App.. Thanks for taking the time to discuss this, I feel strongly about it and love learning more on this topic. I really love I phone. . .I am planning to buy one ..soon . .great post. . . Thanks a lot. And all of this is free before the Apple step?